Sooo, my sister's fiance bought me this magnet, and the oddest thing is, that I can't figure out if I've ever been to Arkansas before. I want to say yes - because it's on the way to Oklahoma, and I've driven there. I want to say no - because I honestly don't remember passing through it. Sigh, sometimes, I wish our family's almostcross-country trip was done a little bit later in life, so I'd remember a bit more. 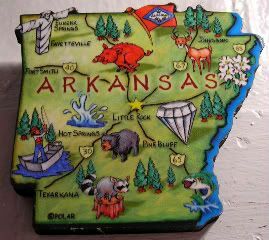 But, I picked this one for today's magnet, because Arkansas joined the Union this day in 1836, the 25th state to do so. It's funny, I just went to go look up any interesting facts, and found this page with way too much copy and way too many bullets. Dudes, I was just lookin' for state bird, flower, etc. Though, this is kinda funny - apparently, much of the early settling of this territory was done by the French, that's why a lot of the place names are French pronunciation of Indian words. Apparently, back in the 17 and 1800s, they were decided on whether or not to pronounce their home as ArkanSAW or ArKansas - they couldn't even decide how to spell it, either. Finally, in the 1880s, the state's General Assembly had to pass a whole resolution to settle the debate with a compromise: spell it Arkansas (in deference to the French explorers), but pronounce it ArkanSAW (in deference to the original Native American inhabitants). Heh. Nope, that's not confusing at all. Heh, my dad just informed me that I've been Arkansas. Well, at least three of their rest areas. Hahahahaha. OK. Oooohkay. I just found out, thanks to Nat Geo's Intelligent Travel blog (via Jaunted) that I could dig for diamonds in Arkansas at the Crater of Diamonds State Park. Hmph. I guess that's why they have that big fat diamond on this magnet. Dig. For. Diamonds. At the Crater. Of. Diamonds. State. Park. Ya'll. We must ALL head down to Arkansas. Posthaste!!! Bwahahahaahaha. Mebbe so, Gordon, mebbe so. Rollin', rollin', rollin', those eyes! NOW you tell me? NOW? Really?